On the heels of this success followed several years of turmoil for Beyoncé and her bandmates. A growing resentment concerning what was perceived as preferential treatment by Mathew Knowles to his daughter resulted in a demand for his termination as manager of the group, and soon after singers LeToya Luckett and LaTavia Roberson departed. Two replacements were found, but by 2000 Destiny's Child was down to the trio of Knowles, Rowland and Michelle Williams. Despite the personal hardships, the popularity of the group never waned, each successive album (1999's The Writings on the Wall and 2001's Survivor) becoming more popular than the last. In 2003 Beyoncé struck out on her own with Dangerously in Love, which featured collaborations with Missy Elliott, Jay-Z and Sean Paul, amongst numerous others. The album did not deviate from the pattern of increasing success that was established with Destiny's Child, and both it and its two singles Crazy in Love and Baby Boy earned #1 chart positions. As is inevitable in these cases, Beyoncé also took time away from her music to establish a career as an actress -- taking a starring role in the made-for-TV "hip-hop opera" Carmen, followed by big-screen appearances in Goldmember (2002) and The Fighting Temptations (2003). Doubtless, more on this front is forthcoming. Soon after releasing their fifth studio album, 2005's Destiny Fulfilled, Destiny's Child announced they would cease to exist that same year upon completion of an extensive world-wide tour. 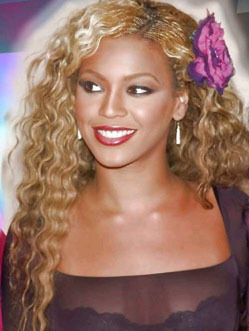 Beyoncé subsequently released the single Check On It (featuring rapper Slim Thug), which appeared both as one of three new tracks on the Dentiny's Child greatest hits compilation #1s and on the soundtrack to a remake of The Pink Panther (2006) starring Beyoncé and Steve Martin. The end of her band certainly did not result in an excess of free time for the singer, as solo and acting careers still had to share her schedule with a clothing line (House of Dereon, established with her mother Tina) and ongoing endorsement deals that included Tommy Hilfiger, Pepsi and L'Oreal. In December 2006, gossip website MediaTakeOut.com claimed to have obtained a scanned index of births registered in 1974 from an employee of the Texas Department of Health which showed that Beyoncé Giselle Knowles was seven years older than the 1981 birth year she has always claimed. The document, from an index of Texas births sold by the Texas Department of Health to several genealogy websites, was from 1981 but had been altered by the "employee" to read 1974.